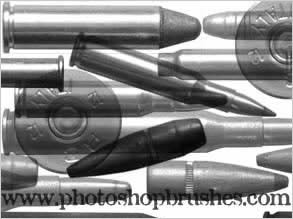 Twelve Gun related photoshop brushes, featuring different sized shotgun cartridges brushes photographed at different angles, empty bullet casing from all size rifles and a good selection of large and small bore rifle bullets and bullet tips. There will be a new set of Hand Gun Photoshop Brushes added in the coming weeks, these will be good. A big thanks to 'Sniper Ben' who allowed me to photograph the contents of his gun cabinets.